A reader recently complained (or kvetched, perhaps) that I didn’t review enough accessible products, stuff that you’d find on the shelf of your average liquor store and didn’t cost five figures. Fair enough, so here you go. It doesn’t get much more mainstream than Tanqueray, the British gin (produced in Scotland, actually) which is one of the best-selling spirits in the world. 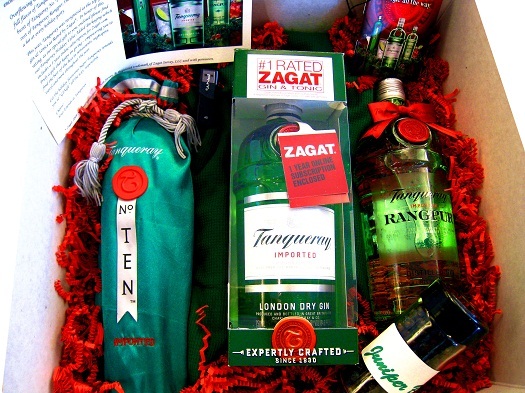 Tanqueray exists in the U.S. in three varieties now (there’s also a vodka), and I recently received a holiday kit from the company so I could try them all side by side. I prefer Rangpur to the normal London Dry because you can often buy two 375ml bottles of it at bevmo for cheaper than the cost of either bottles. I have not checked up on that for a while so maybe bevmo finally got wise. Also the London Dry reminds me of pine sol. Not a very pleasant taste. Ten is good, but for the price I prefer Plymouth. You’ve written a great assessment of Tanqueray’s new “Rangpur” “gin.” It isn’t like any gin I’ve ever had and I agree that it’s “almost chemical.” I was planning to use the word “chemical” before I read your review. My take: Don’t plan on buying again – it’s awful! I think it’s a mistake for Tanqueray to associate itself with this “new style” “flavored vodka.” If they want to bottle it ok, but not with the word “gin” on the label.